This entry was posted in Africa, Travel Photos and tagged Africa, Birds, Cape Town, Nature, Photography, Photos, South Africa, Travel, Travel Journal, Travel Photos, Wildlife. Bookmark the permalink. Aww, they’re so cute. Great photo! Wow, the mom (or dad!) really does look like a statue! They are beautiful though, and those little ones are adorable! The little ones look so soft and cuddly. So adorable. They look like the geese we have in our neighborhood. But I don’t know what they are called either. So adorable. These look like geese we have in our neighborhood. But I don’t know what they are called either. I am horrible at remembering names of birds. I need to get better, or at least buy some bird books so I can figure it out. OMG – the cuteness! We went for a walk last weekend down the canal and saw some lovely baby ducklings! – One (only one) was literally canary yellow – I wish I had a photo of that. Ducklings are adorable…I’m a sucker for any baby animal. I should go looking for some ducklings and get photos. Thanks for both! You are wonderful! 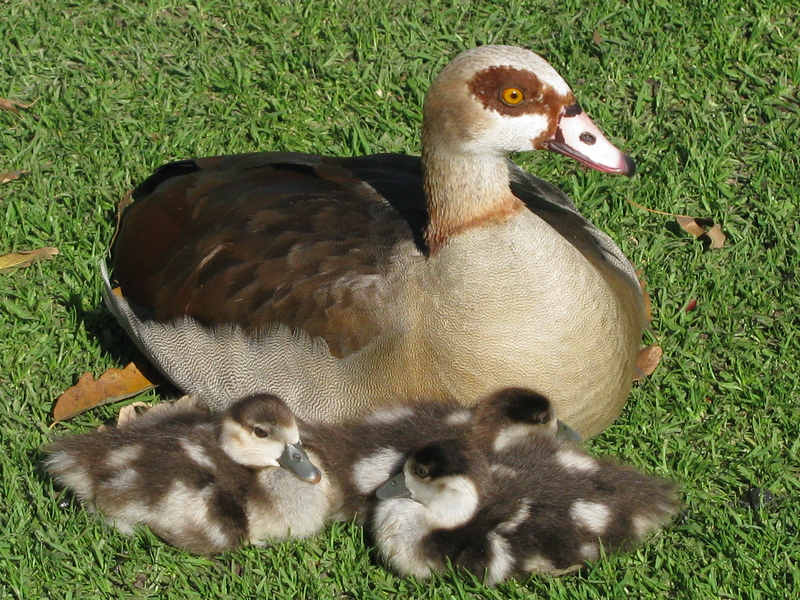 Mom’s markings are extremely unusual; different any duck I’ve ever seen. And her babies are just precious… how could they not be? They are babies. 😉 So cute! I was fascinated by the mother. She is so striking and regal. And yes, all babies are cute…they just can’t help it. Awww…What an adorable family! The fluffy little ones are so cute! Thanks! Glad you liked the photo. Babies are a special part of this world. She does look like a sculpture, doesn’t she. Indeed…I had to watch for before I determined she wasn’t. I see lot of them in the park where I exercise. Beautiful creatures. Cape Town 😀 Was this at Kirstenbosch Gardens by any chance? I saw little chicks like this there last year. We found these little guys in a park by the hotel but I don’t think it was the Kirstenbosch Gardens. Gosh the baby ducks are cute! Their mom is unusual but beautiful. I used to see a lot of grown up ducks near my workplace. The past few weeks I have been seeing a bunch of baby ducks swimming or preening themselves, apparently unsupervised. Usually baby ducks (or any other baby animals) always stay close to mom. But these babies stand separately from the adults. They look healthy, well fed and in no way distressed. Wonder what’s going on. That does sound odd…I hope all is well.